The Non-GMO, holistic formula for the balance your dog needs. Renew Gold Balance™ is a unique, proprietary formulation that uses a combination of carefully selected Non-GMO ingredients. We chose chicken meal and pork meal as the main protein sources for their digestibility and delicious taste. In addition, Renew Gold Balance provides the benefits of health supporting ingredients such as Coconut Oil, Stabilized Rice Bran, Dried Egg Product and Flaxseed. These ingredients work together to support the immune system and the digestive system. The result is a unique a combination of nutritional support, a taste that your dog will love, and a pleasant coconut aroma that is a vast departure from traditional dog food odor. 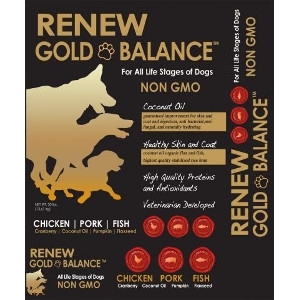 Renew Gold Balance is a revolutionary step forward in premium nutrition for your dog. Renew Gold Balance–delicious, nutritional food for all life stages.